This Mid-June 2017 edition of Modern Restaurant Management (MRM) magazine’s research round-up includes TripAdvisor’s Diner Engagement Study, the Love List: Food, the cost of feeding teenagers and Father’s Day statistics from our friends at Upserve. The new TripAdvisor “2017 Diner Engagement Study” analyzes the way in which consumers interact with TripAdvisor’s more than 4.2 million restaurant listings. With over 150 million average monthly restaurant browsers, TripAdvisor is increasingly becoming one of the most effective and popular performance marketing channels for restaurateurs, and thU.S>, it is important that owners understand how to better manage and maximize their bU.S>iness listing. Diners spend double the amount of time viewing TripAdvisor restaurant listings that have at least 20 reviews, compared to similar restaurants with no reviews. Restaurant listings with a single management photo incur up to 44% more interaction than a restaurant with no photos. Restaurants that display hours of operation on their TripAdvisor listing have an average of 36% more diner engagement than restaurants without them. · What are we doing for father’s day? Families everywhere reliably take their moms out to eat for mother’s day … but father’s day is not so clear cut. We’re just as likely to meet for a bbq as we are to go out to dinner – and dad is much more likely to get a “Relaxing day” than mom is. · Restaurant Tips: Prep for dinner, and bring out the beer: dads everywhere prefer a cold one. · Beverage trends: Craft beer reigns supreme. Dads everywhere prefer a beer on father’s day … but the older they are, the more likely they are to order a wine or a cocktail. What are Millenials and Gen Z Planning? · Much more likely to take mom out to eat (38.5 percent) but split right down the middle with dad: 24.3 percent want to eat; 24.9 percent want a get together. Overall, the restaurant industry is pushing certain technology trends in order to be more profitable and competitive, but consumers are not necessarily agreeing. Most consumers prefer old-fashioned dining-out (51 percent) over ordering take-out for pick-up (29 percent), but, nearly two-thirds (65 percent) of restaurants have plans for technology investments in the next 12 months – on average around $4,200 – which can be expected to be spent on ordering technology. Consumers are more likely to rely on consumer review websites such as Yelp or Foursquare (33 percent), than professional review websites (7 percent) or posts on social media (16 percent). The majority of restaurants however, are more likely to use some type of social media promotion for their business, most frequently Facebook (85 percent) and Instagram (46 percent). Outside of tech, 29 percent of restaurants have or are considering adopting a no tipping policy but 63 percent of customers would like to continue being able to tip their servers. Additionally, restaurants may not be marketing to their core audiences… On average half of restaurants indicate that the majority of their patrons are Gen Xers (49 percent) and just over a third say the majority of their patrons are Millennials (35 percent). However, more restaurant owners are currently targeting Millennials (45 percent) with their marketing and promotion than Gen Xers (39 percent). Findings from Technomic Inc.’s recently released Top 250 Fast-Casual Chain Restaurant Report indicate that despite industry-leading growth, the fast-casual segment is not immune to the challenging operating conditions facing the broader restaurant marketplace. Technomic’s annual report reveals that the Top 250 fast-casual chains grew sales a cumulative 8.4 percent in 2016 to a total of $40.4 billion. While this growth significantly outpaces other industry segments, it lags compared to the 11.9 percent sales growth in 2015 and 13.8 percent growth in 2014. A key factor contributing to the slowing sales growth trend is decelerating unit development within the segment, which registered at 8.9 percent in 2016, following a rate of 9.6 percent unit growth in 2015. From a chain-level perspective, the struggles of Chipotle had a substantial impact on the overall performance of the Top 250, as the second-largest fast-casual chain saw its sales drop by more than 13 percent in 2016. Helping to push the segment in a positive direction, however, were leading chains Panda Express, Jimmy John’s and Zaxby’s, which all saw double-digit growth and operate with annual sales volumes well over $1 billion. The fast-casual pizza segment continues to be a growth engine as well, with the menu category increasing its sales at a cumulative rate of 35 percent. Look for specialty and health-focused concepts to continue to shine and move up the rankings over the coming years as chains like Sweetgreen, Modern Market and Lemonade expand their location presence and attract increasingly health-conscious consumers. May was a disappointing month for chain restaurants by most measures. Same-store sales were down -1.1 percent, which represents a 0.1 percentage point drop from April. The industry has not reported a month of positive sales since February of 2016. These results come from data by TDn2K™ through The Restaurant Industry Snapshot™, based on weekly sales from over 27,000+ restaurant units, 155+ brands and representing $67 billion dollars in annual revenue. Same-store traffic growth was -3.0 percent in May, a 0.2 percentage point improvement from April. Although traffic results improved from prior month, the growth in check average was lower than it has been in recent months, causing the fall in sales growth vs. March and April. “With little happening in Washington to alter the landscape for growth, it appears as if the economy will again expand this year at the same pace it has averaged for the past seven years, which is 2.2 percent,” explained Joel Naroff, President of Naroff Economic Advisors and TDn2K Economist. That is enough to continue driving down unemployment rates and putting greater pressure on firms trying to expand and hire new workers. Wage gains are still accelerating slowly, though, limiting household spending power. Recently, there has been an upturn in retail spending on most goods and services. That stands in stark contrast to the continued decline in sales growth at restaurants. Consumers appear to be maintaining their spending at restaurants but increasing it for other goods and services. This change in consumer spending patterns was identified about a year ago and how much longer it will continue is unclear. While overall sales continue to be a challenge for most of the industry, there are pockets of opportunity that some brands have capitalized on to boost performance. Dine-in sales have been negative year-to-date, but to-go is up 2.9 percent. Sales are also up in catering, delivery and drive-thru. From a day part perspective, breakfast and mid-afternoon sales offer continued opportunities for growth, while lunch and, especially, dinner sales continue to stumble. May sales were weak across all segments. Only the fine dining segment was able to achieve very small positive same-store sales growth during the month. The second best performing segment during May was quick service. That soft performance notwithstanding, the best performing segments continue to be those with the lowest and highest average guest checks. 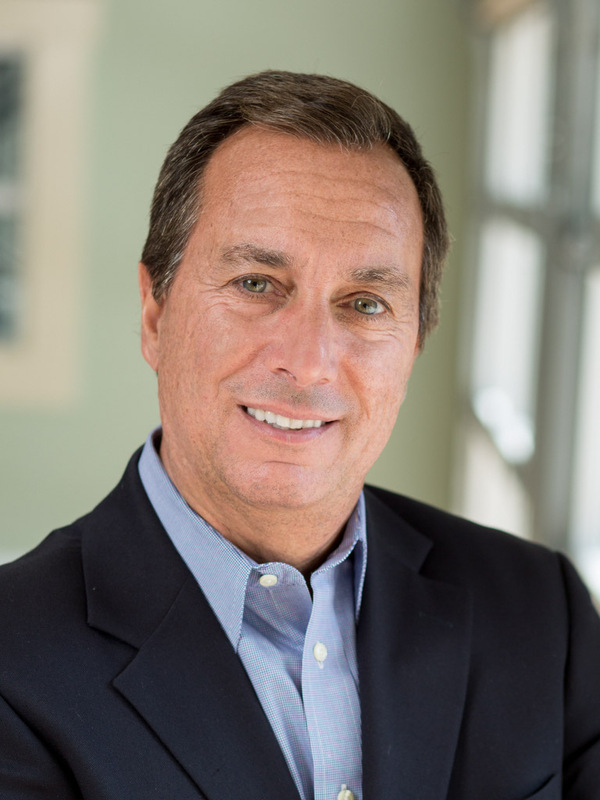 “Dining experience on one end and value and convenience on the other seem to continue to be key components of restaurant sales performance based on current consumer spending trends,” said Fernandez. The weakest performing segment in May was casual dining. This was a bit unexpected since the segment showed improved performance during the first four months of 2017 after lagging the industry for several years. Casual dining has added a modest number of new units, but same-store sales declines have contributed to its overall loss in market share. Despite weak sales results year-to-date, fast casual continues to win the market share battle. It gained the most share in the first quarter of 2017 compared with the same quarter a year ago. Aggressive expansion has driven total sales growth, but increased competition and market build-out have undoubtedly impacted same-store sales for the segment. The only other segment that gained market share year-over-year was quick service. In addition to what they are facing in terms of falling guest counts and consumer spending, strong challenges continue to confront restaurants in both staffing and retaining enough qualified workers. TDn2K’s People Report Workforce Index™ continues to indicate that restaurant operators are pessimistic regarding the difficulty of recruiting in the upcoming quarters. Part of the problem is that hiring for new restaurant positions has started to pick up again. The number of employees in the chain restaurant sector increased by 1.9 percent during April compared with a year ago, up from 1.5 percent growth recorded in March. The other issue affecting staffing is rising turnover. Meanwhile the overall labor market nearing full employment doesn’t hint at relief for operators any time soon. The consequences of turnover are well documented by TDn2K. Not only does it impact service levels and guest satisfaction, which correlate to traffic and sales, but it is also a huge source of additional costs hurting the bottom line. According to a recent study by People Report, it costs on average about $2,200 to replace a single restaurant hourly employee, while the cost of turnover for all levels of restaurant management is on average about $15,000 per manager. “The companies who are leading in the marketplace are starting by winning in the workplace. Being a great employer has never been more important,” stressed Doolin. For the second consecutive year, Dinova, Inc., and The BTN Group have partnered on a joint industry research study. Once again, the research finds that business dining is one of the more undermanaged areas of the corporate expense budget. Business dining spend historically has represented around 10 percent of overall annual T&E spend, but 44 percent of respondents indicated it represented 11 percent or more this year. This increase in spend offers the opportunity for significant cost savings efforts on the part of corporations nationwide. When asked what percentage of meals and dining expenditures occur in employees’ home market(s) versus business travel, only 10 percent of respondents indicated that 50 percent or more meal expenses are at home while 24 percent indicate less than 10 percent of meal spend is in home markets. Millennials want healthy snacks: 40 percent of brands that made the Love List are traditional snack brands, of those, 75 percent have a health focus like Angie’s & Noosa. Top attributes for all brand favorites include: “convenient,” “easy to find,” and “good tasting” – a clear snacking alignment. When price and quality are consistent, brand ethos is paramount:Consumers are focused on authenticity, transparency and connectivity when it comes to the brands they buy—successful brands are clear about what they stand for. Hungry teens are home for the summer, and parents might want to brace themselves for a bumper grocery bill. That’s after new research finds the average parents spend an incredible $51,790 in footing the bill to feed a ravenous teenager. Malia Bacig, a 2017 graduate of the Fritz Knoebel School of Hospitality Management at the University of Denver, won the Global Tourism & Hospitality Conference’s champion prize for undergraduate research. She was awarded round-trip airfare, hotel accommodations and entrance into the prestigious conference at Hong Kong Polytechnic University. “Honestly, I was pretty surprised when I found out I’d won, simply because it’s an international conference so any student in the world could apply as long as the paper had to do with tourism or hospitality,” Bacig says. Driven by a passion for the restaurant industry, Bacig focused her research on consumers’ perceptions of restaurants that are described as using local foods. She found that when restaurants market their sourcing of food locally, consumers perceive the restaurants as engaging in more environmentally-sustainable practices, having more nutritious food, offering better prices and value, and being more conveniently located than restaurants that do not source their food locally. “I found it particularly interesting that the phrase ‘local food’ seems to translate into a psychological sense of closeness for many people,” said Bacig. Cheri Young, associate professor in the Fritz Knoebel School of Hospitality Management, who served as Bacig’s advisor on the project, cited the practical applications of Bacig’s research. Bacig’s future starts in July when she begins working full time at the Four Seasons Hotel in Denver as a food and beverage manager in training. While she hasn’t identified her dream job just yet, Bacig wisely understands the value of soaking up as much knowledge as possible at the start of her career. “I don’t really know where I want to end up. I think for the next three to five years, I want to work in operations and grow my skill set, and then move on to something else,” she said, citing her interest in the wine industry, as well as in international vacation planning companies like Inspirato and Exclusive Resorts. Despite shrinking profit margins over recent decades, the U.S. food and beverage industry is still developing, thanks to the adoption of consumer preference changes and newly emerging food trends. Details about the latest overview of the US food and beverage industry, major U.S. food and beverage manufacturers, and new trends in the vegan and vegetarian food sector are some of this week’s top stories on BizVibe. Highlights for the food and beverage market in the U.S. The food and beverage industry in the US makes up around five percent of the country’s GDP and 10 percent of its employment. According to the US Committee for Economic Development, there are over 27,000 food and beverage organizations and businesses in the US employing 1.5 million people, making the market highly competitive. Emerging trends are changing the food and beverage market in the U.S. today. For example, general food preference in the US is becoming more health-conscious, demanding more natural and organic products. Sustainable food products from environmentally friendly and socially responsible companies are becoming increasingly popular among US consumers. Additionally, the growing demand for food and beverage E-commerce services is also shaping the industry. BizVibe’s list of the top 10 food and beverage manufacturers in the U.S. 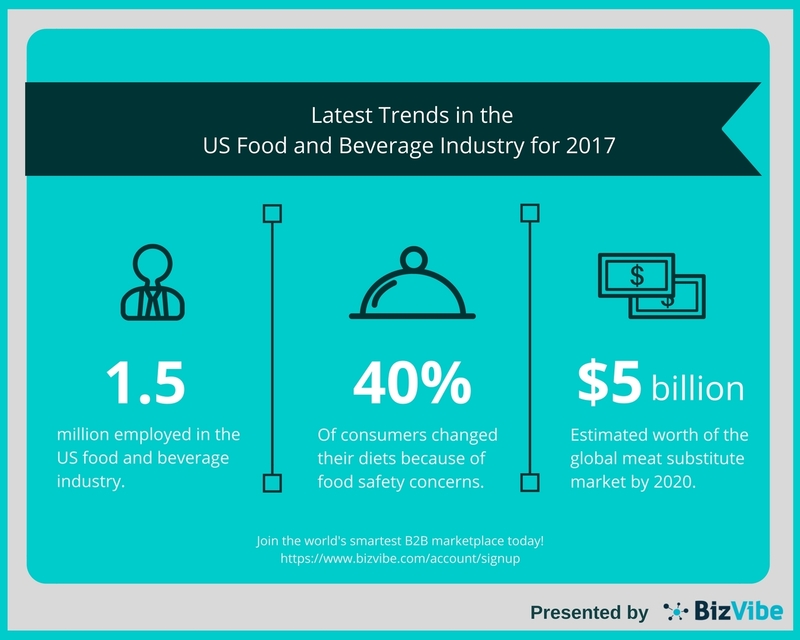 The food and beverage market in the US is becoming more competitive as it grows, and the major food and beverage manufacturers in the country are highly influential in the industry. Here’s BizVibe’s list of the top 10 major food and beverage manufacturers in the US, featuring some of the largest food and beverage manufacturers in the country, such as Conagra Brands Inc., PepsiCo Inc., The Kellogg Company, The Coca-Cola Company, and Campbell Soup Company etc. See the entire list of the top 10 food and beverage manufacturers in the US from BizVibe. As vegan and vegetarian diets become increasingly popular all over the world, the market has witnessed some ongoing trends that are shaping the growth of vegan and vegetarian food industry. Many fast-casual restaurants in North America and Europe are offering vegan and vegetarian options, and the number of vegetarian-only restaurants are also soaring. Additionally, the global meat substitute market—which includes products like tofu, textured vegetable protein, seitan, and others – is also booming, and expected to grow at a CAGR of 8.4 percent until 2020, when it will be worth over USD 5 billion. Since 2011, consumer spending in the foodservice channel has seen significant growth, with U.S. diners now spending, on average, $144 per month on food prepared outside the home — $25 more than two years prior — according to new research published in the third edition of The Why? Behind The Dine™. This annual report released by Acosta, a leading provider of integrated sales and marketing solutions for major food and non-food manufacturers, distributors and operators across all away-from-home meal channels, and Technomic, a fact-based research and consulting firm in the food industry, reveals this spend represents 35 percent of U.S. diners’ total monthly food budget, a jump of five percentage points from last year. U.S. diners spend, on average, $144/month on food prepared outside the home, according to The Why? Behind The Dine. 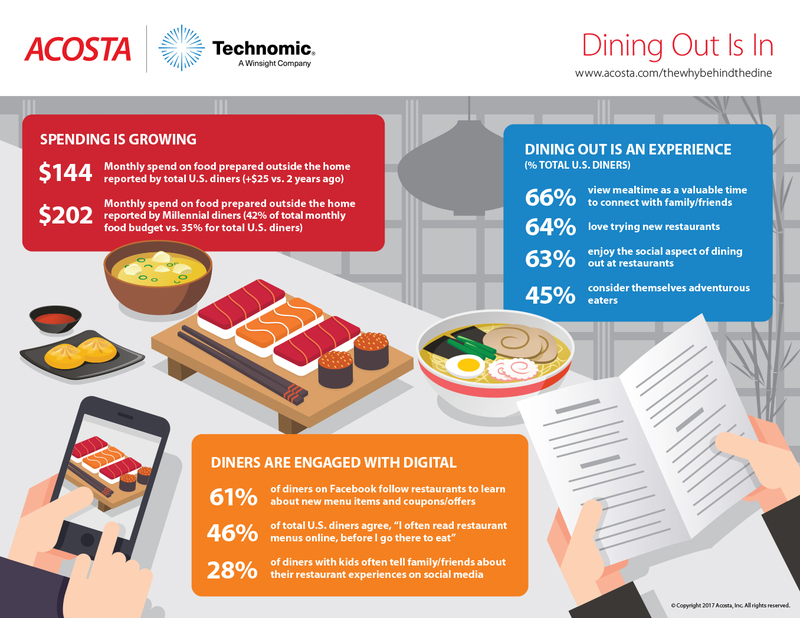 Total U.S. diners surveyed agreed that time spent dining out is both valuable and enjoyable, even more so than the year prior, illustrating how experiential factors frequently drive dining decisions. Sixty-six percent of diners agree they view mealtime as a valuable time to connect with family or friends. Sixty-four percent of diners say they love trying new restaurants. Sixty-three percent of diners agree that visiting restaurants is a form of entertainment for them. Forty-five percent of diners consider themselves adventurous eaters. Spending on food prepared outside the home varies greatly across generations, with Millennial and Gen X diners taking the lead. Forty-two percent of Millennials’ monthly food budget is spent on food prepared outside the home, more than any other generation. This is seven percentage points above the percent of the monthly food budget spent by total U.S. diners on food prepared outside the home. Thirty-five percent of GenXers’ monthly food budget is spent on food prepared outside the home. Over the next year, 53 percent of Millennial diners plan to eat more meals outside the home. Dining at restaurants remains the most popular format for eating out, but compared to the year prior, more diners report using carryout, delivery and drive-thru options, with convenience being a primary motivator. The rate of U.S. diners who ate-in at a restaurant’s dining area in the past three months has remained steady year-over-year at 82 percent. Seventy percent of diners ordered carryout from a restaurant over the past three months, while 67 percent ordered from a drive-thru, and 50 percent ordered delivery food in that same time period. Fifty-six percent of Millennial and Gen X foodservice dollars are being spent “off-premise” (such as through carryout or delivery). The digital world serves as a catalyst for dining decisions, as U.S. diners research options online, and continue the conversation on social media by posting reviews of their experiences. Forty-nine percent of diners look for coupons/offers online for restaurants. Forty-six percent of diners often read restaurant menus online before going there to eat. Sixty-one percent of diners on Facebook follow restaurants to learn about new menu items and for coupons/offers. Twenty-eight percent of diners with kids indicate they often tell family and friends about their restaurant experiences on social media, with many including photos of their meals. The third edition of The Why? Behind The Dine™ study was fielded in December 2016 in partnership with Technomic Inc., using a random sample of 1,500 U.S. diners. To access the full report, visit www.acosta.com/thewhybehindthedine. FoodLogiQ and 1WorldSync published a survey that reveals supply chain transparency by food companies is a critical driver in consumer purchasing decisions and brand loyalty. Commissioned by FoodLogiQ, A Food Company’s Guide to What Consumers Care About in the Age of Transparency found that 54 percent of respondents want as much information as possible on the label, and nearly 40 percent want country of origin, allergen alerts and GMOs all identified on the label. For food companies to provide this transparency and maintain their customers’ loyalty, they need full end-to-end supply chain traceability technology. This technology centralizes their data, creating a single source of truth to enable consumers to make informed decisions about food safety and compliance issues. Over 50 percent of respondents expect food companies to fully address a recall or foodborne illness within one to two days. Eighty-eight percent of respondents across all demographics – from Millennials to Boomers – are willing to pay more for healthier foods including those that are GMO-free, have no artificial coloring/flavors and are deemed all natural. Food production results in hidden impacts for people and planet. Financial auditor EY and sustainability consultant Soil & More have now developed a method for small and medium-sized enterprises to calculate these hidden or’external’ costs. To illustrate the method, they calculated the impacts of organic distributor Eosta for nine types of produce and the company as a whole. For soil and health impact, large differences were found between organic and non-organic production. The ‘True Cost Accounting in Food, Farming, and Finance’ study calculated the cost of water pollution, pesticide exposure, greenhouse gas emissions, and soil erosion for several types of produce. A comparison was made between organic products and non-organic products. The report includes an Integrated Profit and Loss statement for Eosta, one of the first to be published for a SME company worldwide. One of the findings is a difference between organic and non-organic products in health costs as a result of pesticide application. The study combined data from Danish scientist Peter Fantke, the European Food and Safety Authority, and the EcoInvent database to determine the effects of pesticide exposure. The WHO provided the metrics to monetize health impacts. The difference was biggest for apples from Argentina-with an advantage of the organic variety of €0.19 per kilo. The soil erosion difference was significant as well; on average, organic produce had a positive impact in terms of cost while conventional production had a negative impact. At a consolidated Eosta level, the difference for erosion was €1.8 million. Valassis, a leader in intelligent media delivery, shares tips for marketers and millennials, keeping in mind this consumer segment’s unique preferences and need for a budget-conscious lifestyle upon graduation. College graduates are often faced with a new set of financial responsibilities as they prepare to enter the workforce, including rent, utilities and student loans, for starters. For those who are accustomed to convenient amenities in their dorm rooms and dining halls, new tasks like weekly grocery shopping and home maintenance may have a significant impact on their bank accounts. Offer coupons online and offline. Marketers should ensure a robust, integrated strategy is in place, as 94 percent of millennialsuse coupons when purchasing consumer packaged goods. Keep in mind that 91 percent of millennials use paper coupons – received in the mail, newspaper, in store or printed from a computer – and 89 percent use paperless discounts, via their smartphone or downloaded to a loyalty card. Activate via mobile. Mobile is obviously critical to any strong marketing plan as consumers – especially millennials – spend more time on their devices. Through use of location-based targeting, local businesses in the restaurant, entertainment, retail and beauty industries – among others – can offer convenient, relevant messages and deals that reach and activate consumers at the right time. Don’t let your loyalty strategy be an afterthought. It’s important to retain your existing customer base, as it costs five times as much to attract a new customer than to keep an existing one. Loyalty programs can keep customers coming back, as proven by The 2016 Bond Loyalty Report, which cites that 81 percent of consumers are more likely to frequent a business that has a loyalty program and 73 percent would recommend brands with good loyalty programs. See Valassis’ tips on driving brand loyalty for lasting customer relationships: Top 10 Loyalty & Local Marketing Practices. Transparency Market Research (TMR) states that leading companies in the global hydroponic vegetables market are AMCO Produce Inc., Village Farms International, Inc., Soave Enterprises LLC., and Thanet Earth Ltd. As the competition intensifies, these companies are staying focused on investing in advanced technologies such as adopting computer-controlled drip irrigation systems and shrink wrapping among others. According to the research report, the global hydroponic vegetables market is expected to be worth US$12,106.5 mn by the end of 2025 from US$6,934.6 mn in 2016. During the forecast period of 2017 and 2025, the global market is expected to register a CAGR of 7.5 percent. Out of the various vegetables, the lettuce segment is projected to lead the global market in the coming years as it is poised to expand at a CAGR of 6.6 percent during the forecast period. From a geographic point of view, the Europe hydroponic vegetables market is slated to acquire a share of 52.3 percent by the end of 2025 in the global market. The growing demand for locally grown vegetables has been instrumental to the flourishing hydroponics vegetables market across the globe. Owing to this reason, several farmers are catering to the burgeoning need for local vegetables, which is a far more profitable business. The freshness of hydroponically grown vegetables and the demand for organically and naturally grown food items are expected to propel the global market. The emerging trend of farmer’s markets, increasing number of community-sponsored agriculture initiatives, and growing adoption of direct-to-consumer distribution are expected to work in the favor of the global hydroponic vegetables market. The increasing inclination of retailers to source vegetables that are locally-grown as they are better in taste, do not need additional transportation costs, and longer shelf life is expected to favor market growth. The growing concerns about food security due to increasing population and rapid urbanization have also become important in propelling the rise of the global hydroponic vegetables market. The growing challenges pertaining to cultivation of grains and vegetables in conventional ways has made farmers take a serious interest in hydroponics. Thus, several countries are investing in developing vertical hydroponic farms that are likely to be cost effective in the coming years. The promise of food safety and reduced exposure to pathogens has also titled attention toward hydroponics. On the flip side, the global hydroponic vegetables market is being hampered by the high capital investments required for developing these modern farms. This impact is especially severe in developing countries of the world. The exorbitant cost technology, consultations, and maintaining greenhouses is likely to discourage market growth. Additionally, the high energy requirement as compared to traditional farming is likely to restrain the market from achieving its full potential. According to a just released consumer survey, flavor and texture are the top reasons people enjoy cooking with meat, and the fear of missing that is the reason fewer people follow a plant-based diet. Conducted by the California Walnut Board1, the study also revealed meat remains the focal point of plates in more than half of weekly meals. However, because of increased concern about nutrition and health, people want to add more plant-based foods to their routine. The simple solution is to create meatless meals that maintain the qualities they enjoy in meat. To do so, consumers are less interested in tofu and soy products as plant-based options and instead turn to walnuts, legumes and mushrooms. According to the survey, 83 percent of Americans are open to making meatless dishes, particularly if they have a similar taste or texture to meat-centric dishes. Walnuts, mushrooms and legumes, including beans, lentils and peas, rise to the top as the three foods they’re willing to try in meatless meals. Walnuts, specifically, are an appealing option for their texture (70 percent), flavor (65 percent) and nutrients (62 percent). The global healthy snack market is expected to reach USD 32.8 billion by 2025, according to a new report by Grand View Research, Inc. Rising awareness about healthy snacking habit along with the easy to use, and mobility of product is further propelling the market growth. The hectic lifestyle and changing demographics with the rise of young population in Asia Pacific region are some of the factors positively influencing the market. In addition, the preference for healthy snacks over the traditional ones is increasing as it is convenient to carry and consume. These properties are expected to have a positive impact on the industry. The growth in demand for single serve bars of cereals, granola, nuts & seeds, and, meat is rising due to growing working class, which is engaged in long working hours, and prefers nutritious snacks in between meals. The booming retail sector, coupled with efficient supply chain, and creative marketing strategies, is expected to augment market growth over the forecast period. The nuts & seeds, and dried fruit segment are expected to collectively account for 27.2 percent of the global market share in 2025. The demand for these products is attributed to the immediate energy requirement fulfilled by the consumption of these products. In addition, the availability of various flavors is projected to boost the demand for these products over the forecast period. Europe was the leading region due to changing perceptions about snacking among the younger consumers. The younger population is demanding more nutritive function from the snacks, which is leading to growing reliance on snacking as a healthy alternative. The availability of a variety of healthy snacks options is leading to the expansion of the overall market in this region. The market is expected to grow at a CAGR of 5.1 percent from 2017 to 2025 on account of increasing awareness about healthy snacking habits. Cereals and granola bars will witness fastest growth in terms of revenue at a CAGR of 6.3 percent from 2017 to 2025 owing to its nutritious contents. In January 2017, General Mills, Inc., launched a new product series to address the increasing demand of snacks across the globe. The product range includes popular company brands such as Nature Valley Granola bars, Haagen-Dazs ice cream, Yoplait Custard in healthy snacks category. 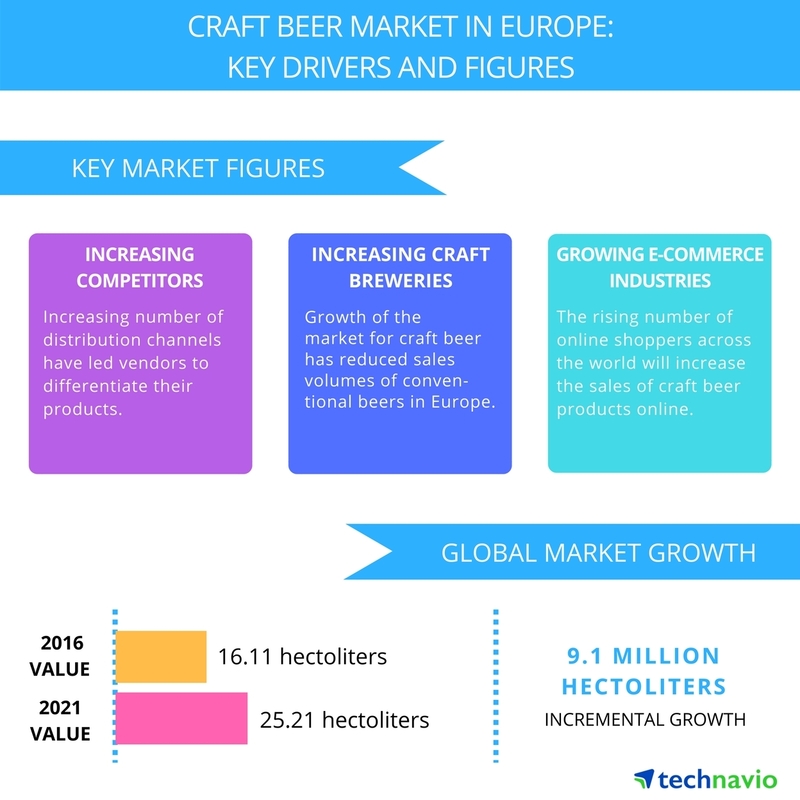 Technavio market research analysts forecast the craft beer market in Europe to grow at a CAGR of more than 11 percent during the forecast period, according to their latest report. The market study covers the present scenario and growth prospects of the craft beer market in Europe for 2017-2021. Craft beer is the variant of beer that is brewed in a traditional fashion and is usually produced in small quantities. The report also lists eight different variants of craft beer, which includes Indian pale ale (IPA), amber ale, lager, bocks, wheat, fruit beer, seasonal, and pale ale. The global craft beer market is primarily concentrated in the Americas and Europe, with the US being the largest craft beer producer, followed by the UK. Europe has witnessed a significant growth in the number of microbreweries operating in the region in the last five years. The number of microbreweries grew by nearly 73 percent in the last five years. A microbrewery is defined as a brewery that produces only limited quantities of beer, primarily specialty beer, and craft beers. The UK and Germany have the most number of microbreweries in Europe. With the rising number of microbreweries in the region, the competition in the craft beer market in Europe has intensified over the years. This has proved to be beneficial for consumers in terms of quality, price, and flavors. In 2015, Europe had 5,830 microbreweries operating in the region. Europe’s microbreweries and craft breweries are continuing to fuel the craft beer revolution in bars, pubs, and liquor stores across the region. With 5,830 microbreweries and 4,486 regional craft breweries in 2015, craft beer now represents close to 12 percent of the beer market in Europe in terms of revenue. “The growth of the market for craft beer has also brought down the sales volumes of conventional beers in the region. This has forced many global vendors in the beer industry to acquire small craft brewing companies to enter the craft beer market,” says Manjunath. More than half of U.S. consumers (58 percent) are more concerned about food animal welfare than they were just a few years ago, according to market research firm Packaged Fact’s recent report, Animal Welfare: Issues and Opportunities in the Meat, Poultry, and Egg Markets in the U.S. In the report, “animal welfare” encompasses key areas including housing, handling, feeding, and slaughter. Rising interest in animal welfare issues is due in part to consumers’ increased concern about the safety of their food, and the growing belief that if an animal is raised in healthy circumstances, then its meat and dairy products will be healthier, as well as better-tasting and more nutritious. Although the common assumption that organic standards currently include animal welfare provisions is a misconception, organic foods such as grass-fed beef succeed precisely because of the consumer assumption that organic certification in meat, poultry, and dairycase foods is inherently linked to animal welfare. Consumers have different levels of understanding and trust when it comes to product claims associated with animal welfare. Packaged Facts survey data reveal that 19 percent of consumers only have a general idea of what ‘grass-fed’ means, with another 19 percent reporting they don’t have a good idea of what the term ‘certified humane’ means. Only a minority of grocery shoppers (33 percent) view themselves as well-informed about claims such as hormone/steroid/antibiotic free, cage-free, free-range, pasture-raised, and certified humane. Nonetheless, nearly two-thirds of consumers agree that humane treatment of animals raised for food should be a societal concern and a regulatory issue. Food companies spanning the production and delivery spectrum, increasingly attuned to consumer as well as investor concerns, have been taking steps to improve the quality of life of the animals in their supply chains. Animal welfare organizations supported by consumers have been a driving force for change, though the decision to improve animal welfare is ultimately left to the individual company, whose response is often grounded in the desire to be competitive in a changing marketplace and proactively responsive to emerging trends. Pork producers are abandoning gestation crates, while egg producers are switching over to cage-free practices. Despite consumers’ varying levels of understanding the relationships between organic brand foods and animal welfare standards, new standards are being shaped by next-generation consumer expectations. 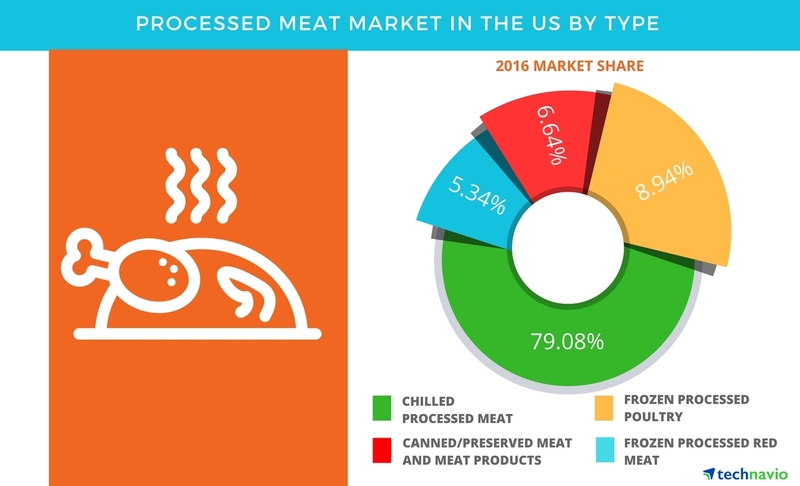 According to the latest market study released by Technavio, the processed meat market in the US is expected to grow at a CAGR of almost 3 percent. This research report titled ‘Processed Meat Market in the US 2017-2021’ provides an in-depth analysis of the market in terms of revenue and emerging market trends. This market research report also includes up to date analysis and forecasts for various market segments and all geographical regions. The processed meat market in the US is expected to grow at a steady pace during the forecast period. The market is driven by the demand for convenience food products among consumers. Health-conscious customers are keen on adding protein to their daily diet, and meat acts as an excellent source of protein. The processed poultry market will grow at a steady pace during the forecast period is because consumers are experiencing a change in lifestyle and growing urbanization is also affecting the consumption patterns of the consumers. Frozen processed poultry has gained higher acceptance over the other meat such as pork and beef due to its high protein content and comparatively affordable price. “Frozen processed poultry meat has a higher demand among consumers as it is less expensive in comparison to other processed meat products. Increased intake of poultry meat owing to its high protein content amongst health-conscious individuals is a key factor boosting the growth of the frozen processed poultry market in the US,” says Akash. Canned meat can be stored for a longer duration of time than other meat variants and can be used when fresh ingredients are scarce. Canned/preserved meat products are less popular compared to frozen food products as consumers consider frozen meat products to be healthier, free of preservatives and additives, and fresh. Canned/preserved meat products are facing competition from ready-to-eat frozen meat products. However, the canned/preserved meat market has started maturing in the US, leading to product commoditization. While consumers may be growing more health-conscious with their food choices, it seems there is still room for life’s little indulgences. New research from Mintel reveals that the top reason Americans say they snack is to treat themselves (50 percent) and more than one quarter (28 percent) agree that taste is more important than health when choosing a snack. When it comes to salty indulgences in particular, Mintel research reveals that the types of salty snacks** consumers eat depends on the occasion. While consumers are most likely to enjoy popcorn while watching TV or a movie at home (62 percent), the various types of popcorn available, such as caramel corn or microwavable, make it versatile as a snack for when consumers want to treat themselves (37 percent) or want something healthy (19 percent). To learn more about The State of Snacking: What’s Happening in Foodservice and Retail, join Mintel’s expert food and drink analysts for a webinar on Tuesday, June 20, 12 p.m. PT/2 p.m. CT/3 p.m. ET. Register here. Beef jerky sales grew by nearly seven percent last year, according to Nielsen. Meat snacks are second only to potato chips in the salty snack category, but potato chips posted only 1.7 percent dollar growth over the same time period. “Beef jerky provides all of the convenience of a traditional savory snack with no cooking or refrigeration needed, but packs a punch of protein and essential nutrients that make it stand out on the snack aisle,” said Alisa Harrison, Senior Vice President of Global Marketing & Research for National Cattlemen’s Beef Association, a contractor to the Beef Checkoff. The need for healthy snacks on the go increases as consumers take to the outdoors during the summer. With race season kicking off, beef jerky also is a powerful tool post-race or workout. In fact, a 2015 study published in theInternational Journal of Sport Nutrition and Exercise Metabolism looked at beef jerky’s effect on hydration status and sodium balance of endurance runners and found that beef jerky as a recovery snack following an endurance bout was comparable to traditional carbohydrate-electrolyte beverages. The distilled spirits industry continued its impressive 19 straight years of growth, rising 2.7 percent in 2016 to 221.0 million 9-liter cases. Continued employment gains and wage increases have led to increased consumption of premium, quality products at home and on-premise. According to the Beverage Information Group’s Liquor Handbook 2017, consumers are spending more and drinking more – 5.8 million cases more than in 2016, to be exact. The American straight whiskey category shows no signs of slowing down after a 6.2 percent increase in 2016. Premium brands continue to grow most rapidly as consumers show a willingness to trade up. As millennial consumers experiment within non-Bourbon segments of the whiskey category, imports are up as well. Canadian Whisky and Scotch rose 2.2 percent and 4.6 percent, respectively, in 2016, while Irish Whiskey saw its thirteenth straight year of double-digit growth, rising 15.0 percent to 3.6 million cases. After demonstrating strong growth last year and after years of negligible growth, the blended whiskey category fell flat again growing just 0.5 percent or 5.2 million cases. Other distilled spirits categories saw mixed results in 2016. Tequila and brandy/cognac showed strong gains of 6.9 percent and 7.8 percent respectively. Vodka, whose growth rate has been slowing in recent years grew 2.1 percent to 74.3 million cases. But gin, rum and cordials/liqueurs showed little or negative growth. Rum consumption remains the second-largest spirit category, but decreasing volumes suggest consumers’ willingness to explore other categories. In 2017, we expect consumers to continue that experimentation, especially as improving economic conditions raise disposable income. Millennials will continue to be the major force behind the growth of distilled spirits with their focus on quality products, perceived heritage and authenticity of legacy brands. Female and Hispanic consumers will represent growth opportunities for the industry now and into the future. According to the latest market report published by Transparency Market Research titled ‘Food Safety Testing Market’: Global Industry Analysis and Forecast 2017-2025′, globally the revenue generated from food safety testing has been estimated to be valued over US$ 658.5 Mn in 2017, which is projected to increase at a CAGR of 8.9 percent during the forecast period (2017-2025). Over the last decade, key players in the market have emphasized on garnering the attention of the consumers by keeping pace with their ever-changing testing patterns. Product innovation to perform more accurate tests has seen an increasing demand from the supply side, to increase the brand appeal and also to provide better services, which is one of the most important parameters considered by consumers. Various macroeconomic factors such as rising disposable income and increasing food trade in Asia Pacific region and other developing regions are expected to fuel the demand for food safety testing over the forecast period. Diagnostic test products are primed for sturdy growth over the forecast period, aiding the expansion of the market. The growth of these products can be attributed to the increased inspection of food plants by regulatory bodies. There are certain factors which might hamper the growth of the global food safety testing market such as lack of uniformity in global regulatory guidelines. Different regions have different guidelines for trading of consumer goods including food and feed, agricultural products, and other products. This is expected to adversely affect the growth of the global food safety testing market. Another factor adversely affecting the market growth is budget constraints. Food testing laboratories in developing countries allot low budget and resources due to budget constraints for upgrading food testing equipment and software. By contaminants type, the global food safety testing market is segmented into pathogens, genetically modified organisms, chemicals and toxins, and others. Among all the segments, Pathogens segment is estimated to account for 42.5 percent of market Share, in the overall global food safety testing market, in 2017. By end-use, the global food safety testing market is segmented into food, agriculture and environment. Among all the segments, food segment is expected to dominate the global food safety testing market by the end of forecast period. Factors such as Increasing awareness regarding genetically modified fruits and vegetables and increasing regulatory restrictions on GMO-derived foods are factors expected to drive growth of this segment over the forecast period. By technology, the global food safety testing market is segmented into q-PCR and d-PCR. Among technology type, the d-PCR segment is expected to account for high CAGR in the market over the forecast period. q-PCR is expected to closely follow the d-PCR segment during the forecast period. Some of the major companies operating in the global food safety testing market are Bio-Rad Laboratories, Inc., Intertek Group Plc, SGS SA, Eurofins Scientific SE, Thermo Fisher Scientific, Inc., ALS Limited. Laboratory Corp. of America Holdings, AsureQuality Limited, Bureau Veritas SA, and Scientific Analysis Laboratories Limited. Butter sales reached their highest level in decades as reviews of past research by some scientists now suggest there is no basis for implicating saturated fat in heart disease, according to Food Formulation Trends: Oils and Fats, a report by market research firm Packaged Facts. The research reviews have generated much controversy with highly regarded nutrition authorities concerned that the conclusions are irresponsible and will result in consumers abandoning decades of moderation and good judgment (or maybe just guilt) when it comes to selecting dietary fats and the foods that contain them. In reality, there is a strong case to be made that other factors matter a lot more to consumers in relation to dietary sources of fats and oils than a distant threat of heart disease. This is especially true when it comes to Millennials and Generation Z consumers, found Packaged Facts survey data. “Even if the latest scientific studies and reviews had confirmed a direct link between saturated fat and heart disease, it can be argued that younger consumers might very well have made the same purchase decisions anyway,” says David Sprinkle, research director, Packaged Facts. Given this consumer orientation, the recent return to butter, along with growing interest in full-fat and grass-fed milk and yogurt, ancestral fats, and specialty oils derived from fruits, seeds, and nuts of plants with healthy connotations, such as coconuts, avocados, pumpkins, pistachios, walnuts, olives, and hazelnuts, should come as no surprise. Expect this new landscape for fats and oils to continue to extend its reach beyond the cooking oil aisle of the supermarket. Savvy processed food manufacturers are already taking note, with salty snacks some of the first products to showcase oils perceived as healthier and packaged cookie brands returning to the indulgent, full flavor of butter.